Microscope image of a neuron (yellow) showing a collection of Huntington’s disease proteins collecting at it’s core (orange). Huntington’s is a devastating genetic disease, described by patients as being like “Parkinson’s, Alzheimer’s and motor neurone disease rolled into one”. In most cases the disorder can be traced back to an inherited genetic mutation which increases the length of the Huntingtin gene. The mutated gene harbours an abnormally long sequence of the DNA base pairs C A and G (this type of mutation is known as a CAG expansion). Sufferers commonly have one normal copy of the Huntingtin gene and one mutant copy and, over time, mutant Huntingtin protein builds up in the brain, damaging neurons and ultimately leading to the devastating symptoms of the disease. A recent wave of articles (here, here, here) suggest that scientists may be on the cusp of a groundbreaking leap in treating this disorder; giving sufferers hope that a new drug could soon stop the march of Huntington’s in its tracks. This drug has been named Ionis-HTTRx and, despite its dull moniker, it represents a pretty spectacular breakthrough in the field of Gene silencing. But what is Gene silencing and what does this drug actually do? Genes are segments of DNA which contain the instructions for making different proteins. These proteins perform a huge range of essential functions in our bodies; from signalling between cells, speeding up biological reactions to forming structural support for our cells. So, to understand Gene silencing, we first need to understand the journey from Gene to protein. Genes sit nestled within the tight curls of the DNA double helix. Specialised molecular machinery within the cell’s nucleus can break open the DNA helix and read individual Genes, creating an almost identical, single sided copy of the Gene known as mRNA. You could think of DNA as a hybrid between a ladder and a spiral staircase, while mRNA looks a bit like a small segment of that ladder which has been split down the middle. It is this mRNA which can slip outside the cell’s nucleus and act as a template for the creation of a protein (through a process known as transcription). How can this process be silenced? 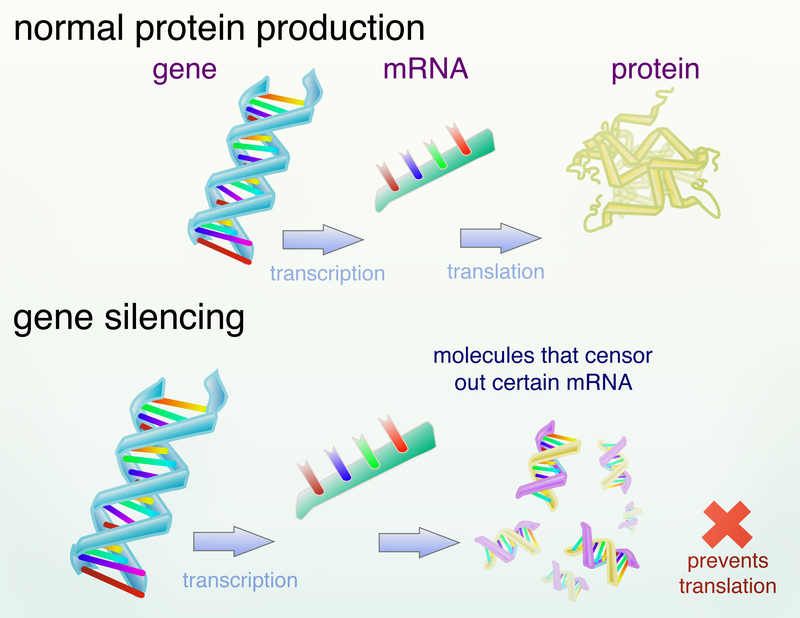 Gene silencing targets mRNA. Scientists have designed molecules which recognise the mRNA produced by specific genes, home in on these strands and stop them from being transcribed into proteins. This means that researchers can target specific proteins and selectively reduce the amount produced in cells. Ionis-HTTRx is a antisense oligonucleotide which looks a bit like a mirror image of the huntingtin mRNA and, due to its structural similarity to the mRNA, it binds to the huntingtin mRNA stopping the transcription process – therefore silencing the gene’s effect. Back in 2012 studies in a mouse model of Huntington’s disease found that when this drug was administered directly into the animal’s spinal fluid, mice showed a delay in disease progression and ‘sustained disease reversal’. While the most recent study involving 46 men and women in the early stages of Huntington’s found that 4 spinal injections, each one month apart, lead to a significant drop in the amount of harmful huntingtin protein present in spinal fluid samples. The trial did not last long enough to uncover whether this drop in harmful protein would ultimately translate into a reduction of clinical symptoms but a second trial, aimed at answering this question, is definitely on the cards. Not only is this discovery exciting for those harbouring the huntingtin mutation, some suggest that the theory behind this treatment could be extrapolated to other conditions – namely Alzheimer’s disease. Our current understanding of Alzheimer’s disease suggests that it is also caused by misbehaving proteins. However, since the genetic causes of Alzheimer’s are more complex and less well understood than those underlying Huntington’s it is yet to be seen whether similar therapies would prove effective in this case. The sound of a howling wolf is ingrained in pop culture. It adds tension to almost any scene, even if you never actually catch a glimpse of the creature creating the sound. It’s not surprising that a well-placed howl can cause anxiety, considering that wolves have a dangerous reputation. A reputation which appears well founded as there have been at least 14 wolf attacks this year alone, injuring almost 30 people. What could be scarier than running into a wolf on a dark night? Perhaps running into a pack of wolves? Especially when we consider that your average wolf is adept at working in a group to solve tasks and cooperating to hunt down their unsuspecting victims. Not forgetting that they are also intelligent hunters, putting domestic doge to shame and making them appear positively stupid. Recent research from the Wolf Science Centre in Vienna has shown that, when it comes to cooperation, domesticated dogs may be missing a trick while wolves take the prize. This might seem counterintuitive, especially when several domestication theories suggest that the tamer and more docile domestic dogs should possess characteristics which improve tolerance and cooperation. However, it was actually found that wolves were more tolerant than dogs raised in a similar environment, and were also more capable of completing a cooperative task. To study cooperation these animals were given a test called the “loose-string paradigm.” This test relied on a piece of apparatus consisting of a length of rope attached to a small board with a reward on. Both ends of the rope are exposed and, in order to obtain the reward, both ends must be pulled simultaneously. If only one side is pulled, the other end becomes inaccessible, and the reward does not move. The ends are at such a distance that one animal cannot pull them both, so two animals must cooperate to get the reward. This is a widely used experimental technique, which has been carried out with a wide range of animals, from shrews to elephants. 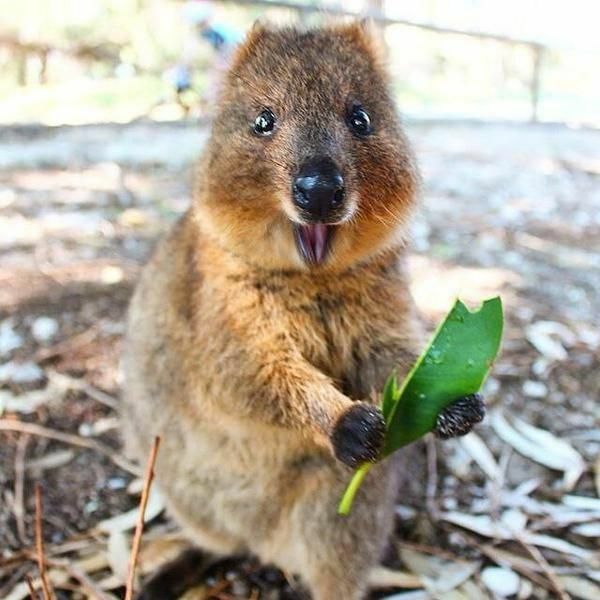 Even the handsome little quokka got in on the act. When first presented with this task, pairs of wolves performed better than dogs. In fact, after practicing, wolves were significantly better at the task than their domestic counterparts. Wolves actually beat dogs on many elements of this test. Firstly, unlike dogs, only one wolf needed to have been exposed to the task equipment for a pair of wolves to perform better. Secondly, dogs were also less likely to interact with the task, while wolves performed a wide array of “non-functional” interactions, when first introduced to the test equipment i.e. biting, pawing or scratching. It appeared that the wolves were more curious and subsequently learned how to carry out the task more successfully. To further test the wolves’ cooperation, a modified version of the loose-string paradigm was introduced. Two sets of test equipment were set up in the same enclosure. In order to complete the task animals had to both pull strings on the same apparatus, ignoring the other equipment. As you can imagine, the rate of success on this variant of the test relied upon compatibility between the animals. Researchers found that animals who showed more affection with each other i.e. behaviour such as grooming, body contact and even tail wagging, were better at completing the task. So, the greater the affection between the wolves, the more likely they were to succeed at the task. It was expected that dogs would be more tolerant of each other, seeing as they are regularly kept together as pets but, repeatedly, the dogs shows more aggressive behaviour towards each other and less affection. In fact one pair of animals had to be physically split up; two dogs, Sahibu and Gombo, you guys are jerks. When the dogs weren’t fighting, they routinely exhibited a simple conflict-avoidance strategy, by not taking part. They were less likely to interact with one another or the task. This obviously led to a decreased rate of success in the dog pairs – as I’m sure you know, ignoring your problems doesn’t help. Just like pretending you can’t hear the wolves scratching outside your door won’t stop them. Moreover, wolf packs maintain a hierarchical social dynamic. Several behaviours have been documented as dominant or submissive. Whilst these behaviours were rare between all animals, they increased after animals were previously exposed to the apparatus. Once an animal knew how the equipment worked it was more likely to act dominant, particularly if the task wasn’t being completed. As we mentioned before, it only takes one wolf to have previously used the apparatus to increase the rate of success. Does this suggest that the dominant wolves were teaching others? Despite this horrifying theory, pairs of wolves who were closer in rank were more successful at completing the task. So, maybe you can sleep a bit better. Finally, the task was altered to delay the entry of the second animal, leaving one wolf alone with the apparatus for 10 seconds. I don’t think I need to tell you what happened. One wolf waited patiently for the other, and the rate of success was similar to that in the other conditions. The rate of success was even higher in wolves which had previously carried out the task together. Not only are the wolves learning how the task works, they are remembering which other animals understand the task. In the wild it is crucial that wolves work together. It’s been previously suggested that “wolves cooperate but dogs submit” and that is apparent in this study. As mentioned above similar ranked wolves work best together, whereas dogs either avoid the problem, or physically clash. Once the wolves understand the task, they are able to teach the tasks to others, and then remember which pack members understand the task. OK, so a friend of mine recently posted a link on Facebook to an article entitled ‘Why being ‘overweight’ means you live longer: the way scientists twist the facts’. I can’t lie, just the title alone made my blood boil. My main concern was, aside from what appeared to be an oversimplification of a phenomenon that scientists know as the ‘obesity paradox’, the title also plays beautifully into the ‘us vs them’ notion that academics are somehow untrustworthy. But, after my blood pressure settled, I decided to give it the benefit of the doubt and read the whole article – I’ve heard at numerous ‘media training’ workshops that it’s not uncommon for editors to alter article titles just before print to make them more appealing and more likely to garner views, so perhaps the body of the article was a bit more nuanced? The article overall gave the impression that the author was well versed in scientific literature, using well placed quotes from research papers to highlight important points. For example, the author quotes a study from 2005 which used medical data (collected between 1971 and 1994) to show increased mortality (risk of death) in those with BMI’s (Body Mass Index) over 30 (i.e. those classified as obese). He correctly points out that the title of this paper (‘Excess deaths associated with underweight, overweight and obesity’) is misleading and implies that being overweight (i.e. having a BMI of between 25 and 30) increases your risk of mortality, when the study actually finds lower mortality in those with BMI’s between 25 and 30 than for individuals in the ‘ideal’ BMI range (18.5-25), I.e. being moderately overweight is good for you. These findings do actually agree with a number of similar studies. In fact, in addition to these findings, there are also a whole host of studies which suggest that being overweight can lead to better survival rates following a large range of medical conditions (for example coronary heart disease, chronic heart failure, stroke and more). So, do I agree with this article? Well, partially. I agree that the obesity paradox exists and these findings are not often spoken about. However, the reason that they are not often publicised is not because academics want to ‘twist the facts’ or, as the author states, that ‘no one can bring themselves to say: Sorry, we were wrong. A BMI between 25 and 29 is the healthiest weight of all. For those of you between 20 and 25, I say, eat more, become healthier’. It’s because there is much more to these findings than first meets the eye. I don’t think many doctors or researchers would argue that obesity, especially weight carried around the stomach, is a major risk factor for type 2 diabetes, lipid disorders, hypertension, coronary heart disease and some cancers. A quick search of Google Scholar will turn up a stack of articles suggesting that increased weight is linked to a whole range of long-term conditions. But, how can both these findings be correct? How can it be possible that being overweight can mean you live longer but you are also more likely to suffer from a chronic illness (i.e. diabetes or heart disease)? I believe that this is the question we are yet to find a satisfactory answer to, and therefore the reason it’s best to be cautious about making statements such as “being “overweight” is the healthiest and most “normal” weight of all”. A paper entitled ‘The Obesity Paradox Does Exist’ expressed this problem very well, stating: “the discussion over the existence of the obesity paradox cannot lead to an underestimation of obesity as a crucial risk factor for the development of cardiovascular and metabolic diseases that requires comprehensive prevention and management strategies”. But what’s my overall impression of this article? I believe that it does raise awareness of a medical phenomenon which needs to be discussed but, that it does so in a dangerous and inflammatory way. Blaming scientists and accusing them of manipulating/twisting results is not helpful. Neither is writing a biased article which does not acknowledge the breadth and depth of understanding around a topic – i.e. it’s just as dangerous to tell individuals that it’s entirely healthy to be overweight (in the case of this article to even go as far as to suggest that the dangers of obesity are greatly overrated) as it is to ignore this obesity paradox entirely and blame everything on excessive weight. We need to be smart and realise that any reference to things being ‘black or white’ is probably dangerously misleading. So, what can we take from this article and the related research? Well, certainly not that it’s always going to be OK to be overweight. But, perhaps that we put too much stock in BMI calculations? Especially when this calculation (weight in kilograms divided by the square of your height in meters) does not take into account the extra weight carried in muscles, an individual’s body shape, fat distribution across the whole body or overall fitness level – all of which are important indicators of whether or not the weight we carry could be harmful. In fact, many of the academics studying this paradox suggest that it may actually be caused by problems related to the BMI measurement rather than any actual protection afforded by excess weight. That means that if you eat well and exercise regularly, even If your BMI is high, you are probably going to be healthier than someone who eats badly, smokes, and rarely gets off the sofa (whatever their BMI). At the end of the day it’s just a number, we all know how healthy our lifestyles are so we shouldn’t believe that such measurements can 100% predict our health outcomes. Hopefully, in the future, researchers can plan studies which allow them to look beyond BMI and work out how different types of fat, where it’s stored on the body and our overall fitness level affect our health – this might give us a better picture of what is really good for us. Nokia and the Connected Health Cities (CHC) programme have launched CityMoves, an eight-week step challenge taking place from 23rd October to 21st December 2017. I’ve already downloaded the app and am having a bit of fun logging my weekly activity. It seems I’m all systems go during the week but make up for it by lazing around over the weekend! The challenge promotes healthy living and the positive use of data and technology in health and research. It’s also an opportunity for citizens across Greater Manchester to help advance science’s understanding of how low-intensity exercise improves heart health. Scientists know that intense exercise, like marathon running, will reduce your resting heart rate. But, they know less about how well moderate exercise such as walking can cause this reduction. Hopefully data from this app could provide an answer. Participants will be able to track their steps through the Nokia Health Mate app, which also allows users to measure their pulse rate using their smartphones camera. Although this does take a bit of practice… Actually I was a bit worried by how my pulse spiked from simply climbing the stairs to my office, I’m blaming my technique but perhaps I just need a bit more gym time? The project will be delivered across Connected Health Cities four city regions including Greater Manchester, Yorkshire, Liverpool and the North West Coast and Newcastle and the North East. Each region will be able to see how the amount of steps they have taken over the period compares to the others’. As well as daily updates on the dedicated website, each week users get personalised feedback with information about their progress and how they compare to others from across the North – A bit of healthy northern competition! Throughout the eight weeks of the challenge CHC and Nokia will keep people motivated with motivational content, seasonal tips to get moving more, hundreds of fitness tracker give-aways and awareness messages on how to keep your heart healthy. After the 8-week period de-personalised data will be sent to The University of Manchester’s Connected Health Cities programme where data scientists will look for changes in heart rate across the study period. “More effective use of data and technology has great potential to deliver health benefits for all of us. The CityMoves study is a great example for people to see the positive impact that their data can have. To join the programme participants can register at nokia.ly/citymoves, choose their team and begin measuring their steps and watch as they rise up their team’s leader board. What colour is your pain? If pain had a colour what would it be? Perhaps a throbbing headache would be a deep purple while a night-time leg cramp might be an intense flash of red jolting you from your slumber? If you were asked to describe the colour of your pain what would it be? And are there common colours associated with different types of pain? Sometime ago I worked on an Arthritis Research UK (ARUK) stand at the Manchester Science Festival. Members of the public were asked to tie ribbons onto a skeleton to show where they experienced pain. The result was fascinating – so many people had knee problems! What was also fascinating to me was the public’s willingness to share their pain stories and get involved with demonstrating where their pain appeared. After this event it occurred to me that people might associate pain with, or experienced it as, a colour but I had no way of testing this theory. Then, I spotted a notice for the Citizen Scientist Showcase, part of the Manchester Science Festival. They were looking for members of the public to set up a stall and promote their own project as part of the Salford Science Jam. Just the avenue I was looking for! This means that I now get to explore my idea, and festival visitors get to contribute to an amazing visual mosaic that has an artistic value all its own. My idea is really simple. Members of the public use a post-it note, piece of paper or maybe even a tablet if we can get the whole thing digitised to draw the colour, and possibly the shape, of their pain. I’m expecting everything from red blobs to electric green squiggles. These individual pieces of art will then be collected and displayed as a wall mural / mosaic showing the full spectrum of colours and shapes making up our perceptions of pain. At the end of the day we will have a mosaic which beautifully combines the science and art behind our pain. The beauty of the exercise is that it can be carried out time and again either as a stand-alone piece or as part of a larger project with each event feeding into a larger work of art. I hope that this little project will create a legacy, perhaps informing further pieces of research looking at how colour can be used to help people describe their pain symptoms. Perhaps this could even lead to new avenues in the alleviation or relief of pain! The Citizen Science Showcase takes place at Salford University’s Media City Campus on Saturday 21st and Sunday 22nd October from 11.00 am to 4.00pm each day. I’m really excited about working on my first piece of “research”. So, if you would like to contribute to this work or have any comments or advice, I love to hear from you. When it comes to healthy eating I’m absolutely useless. Spending extended periods of time in the kitchen is my idea of hell, especially when I could be doing better things (like blogging about how I don’t like spending time in my kitchen). So, when meal time comes around, I usually either rely on my long suffering husband’s culinary skills or trust in the marketing I see on supermarket shelves, erring towards products labeled as as ‘Fat Free’, ‘Healthy Living’ or ‘Nutritious’. This has always seemed like a pretty solid game plan and I’m sure I’m not the only one who uses this method to try and move towards a healthier, more balanced diet. However, as part of my interest in health apps, I downloaded the NHS’s Change4Life app which allows you to play food detective, scanning different products and giving a simple overview of how much sugar, saturated fat and salt they contain and the results were pretty eye opening. The app looks friendly enough with it’s vibrant yellow background and quirky cartoon interface but after a few well meaning scans I started to feel that this app was probably not my friend. My first scan was something I knew would flag up as being unhealthy but I wanted to see just how bad it actually was. So I scanned a box of my favourite chocolate cereal and waited for the result. What I found was pretty shocking. It seems that, for each bowl of tasty chocolate goodness, I’m actually eating the equivalent of 3 cubes of sugar and half a sachet of salt. Since the recommended daily sugar intake for an adult woman is 25 grams (just over 6 sugar cubes), this means that one bowl of my favourite cereal is about 44% of my recommended sugar fix for the whole day – talk about starting the day off on the wrong foot! I must admit I felt that I may have been happier not knowing this information but I certainly wouldn’t be healthier. After this chocolatey revelation, I thought I’d use the app to perform a broad sweep of a range of products in my local supermarket, focusing on those marketed as being healthy. One of the most striking things I found as I scanned around the shelves was that a fair number of products which I always assumed were relatively healthy, usually because that was how they were marketed, just weren’t. Sticking with my theme of breakfast revelations, I scanned a pack of popular breakfast biscuits which are marketed as ‘A perfect source of nutritious sustained energy’. I found that each portion contained almost a whole cube of sugar (1 sixth of your daily allowance in one, supposedly healthy, biscuit), 0.2 grams of saturated fat, and 0.2 sachets of salt. The app’s handy traffic light system rated sugar in this product as being high (red) while saturated fat and salt were both medium (orange). So perhaps this is not the best breakfast option? Next I decided to move away from breakfast and try out a lunch option. The lunch pot I scanned was marketed as a ‘light lunch’, which I, and I’m sure many others, would assume should be a healthy option. This product was a winner when it came to sugar and saturated fat, being low (green) for both but then I looked at the salt. Registering as medium for salt content, one portion contained the equivalent of 3.6 sachets, that’s almost 2 grams or around a third of your daily recommended intake. Although salt often takes a back seat to sugar and saturated fat when we talk about healthy eating, it’s important to know that too much salt in our diets can increase our risk of high blood pressure and heart disease. It’s recommended that we don’t eat more than 6 grams of salt per day, that’s less than one teaspoon! From here I thought I’d move on to look at a few larger ready meals, focusing on supermarket own-brand ‘healthy living’ meals. I was hopeful. The first meal I scanned was low in sugar but contained 5.1 grams of saturated fat and 0.6 grams of salt per portion, this registered as being medium or orange for both. My next two scans sadly seemed to followed the same trend. So, although there were exceptions, it seemed that many of the meals and snacks I scanned which were marketed as healthy or balanced were actually much less healthy than I would have first thought. I also noticed a trend that products which were marketed as being ‘low fat’ were often particularly high in sugar. I guess this is the trade off the manufacturers make but perhaps it should state on the packaging ‘low in fat but packed with sugar to compensate’. Finally, and one of the biggest revelations for me, was when I tried comparing a named-brand wheat biscuit breakfast cereal with the supermarket’s own-brand alternative. The named brand cereal was one of my first ‘all green’ scans with low levels of sugar, saturated fat and salt – pretty much what I would have expected from a simple wheat cereal. However, when I scanned the supermarket’s own product I was suddenly confronted by a unnerving orange traffic light for salt.The app showed that the own-brand cereal contained 0.3 grams of salt per serving, compared to 0.1 for the named brand. I think this is still at the lower-end of medium but I was shocked that this difference existed at all between two brands of what is essentially the same product. I guess that this proves, even if we think we know a product, it’s important to be sure exactly how different brands alter their ingredients. For me, playing with this app has been amazingly interesting. Although the information the app gives you is no different from what you could read yourself on an ingredients list, the app interface gives you a quick and easy way to gauge, in a comparative way, how healthy each product really is. It also offers tips for healthier alternatives and recipes which has given me something extra to think about during my weekly shop. I’m not going to kid myself though, I’m no saint when it comes to food and I don’t think I ever will be but I know how important it is to try and maintain a reasonable balance. This is why the most worrying discovery I made using this app is not the amount of sugar and fat in the foods which I know are bad for me (the things I try to eat in moderation) but it’s the figures the app shows for foods I would otherwise have assumed to be a ‘healthy alternative’. So, I really do recommend downloading the app and trying it out for yourselves, it may just be the fist step on the path to a healthier life.